Exciting news! Jess has been hired again by Drayton Entertainment for training Sandy in ANNIE!!! Performances take place June 2019 and October 2019! Jess will be working back stage along side Sandy for all the performances and is so excited for another amazing opportunity with this amazing Professional Theatre! Jessica was approached by Drayton Entertainment to work on The Wizard of Oz as the canine trainer. One of her clients, a rescue dog named Flynn, would fit right into the role with a bit more training. Flynn came to Impressive Canines when he was a young puppy and learned multiple levels of obedience and some agility. 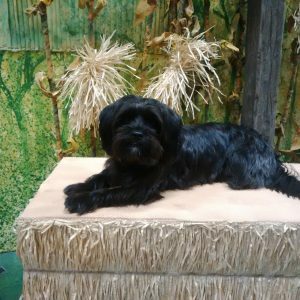 But Flynn was being trained as a pet dog, so she had to work through desensitizing him to the live theatre, for example the stage, lights, costumes, and set pieces. He also had to learn to respond to off stage cues from Jess and learn to respond to Toto as a recall cue. Flynn and Jess attended 2 weeks of intense rehearsals and then the shows started. He then took to the stage and was an amazing Toto. They both had an amazing experience and will never forget those moments! Please note that these videos were all while Toto was in training to prep for the rehearsal period. 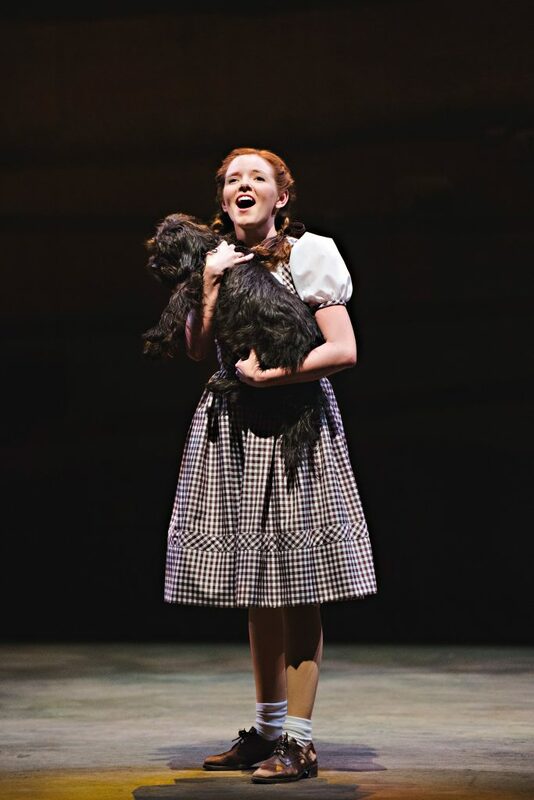 AJ Bridel as Dorothy with Flynn as Toto in The Wizard of Oz, Drayton Entertainment, 2015 Season. Director Madeline Paul, Choreographer Gino Berti, Music Director Jeannie Wyse, Original Scenic Designer Tim McQuillen-Wright, Costume Designer Rachel Berchtold, Lighting Designer Jason Hand. 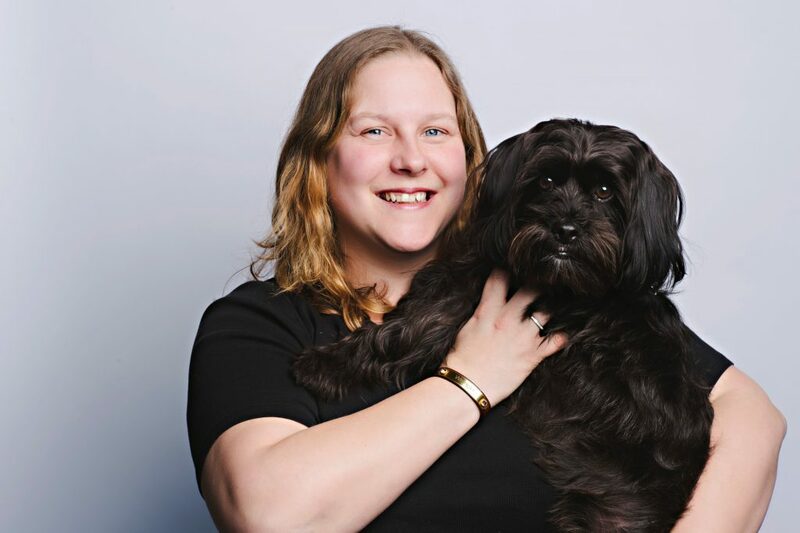 Jess was approached to assist this school with their school production and along side the director, they auditioned 5 of her clients dogs to find their Toto. 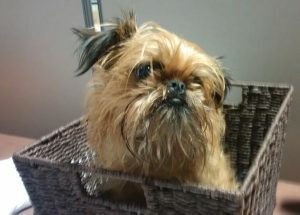 Magnum a sweet Brussels Griffon that also grew up through Impressive Canines obedience classes was chosen and the journey began! Magnum and Jess worked hard together to prep for the show as well as Jess mentored two students that would work with Magnum along Jess’s side for the performances off stage. They performed for approximately 1750 people over the course of 6 school shows. Jessica was hired to teach Twilight who played Bruiser to bark on cue as well as hit her mark on stage along with recalls. This was her first experience working on a professional show as a dog trainer and it was a great experience as well as had it challenges. Twilight never barked and her owner was not sure if we could get her to. It took about 30 mins of thinking outside the box and then Jess was able to capture the behaviour and shape a hand signal to loop the cue and behaviour together. Jess loves opportunities like that, and so her love of shaping behaviours as well as her passion for theatre coming together was a milestone!